Professor Emeritus Riccardo Levi-Setti, a pioneering physicist and Holocaust survivor whose wide-ranging interests spanned cosmic rays to microscopy to trilobite fossils, died November 8, 2018 in Chicago at age 91. Referred to as a "Renaissance man" by his colleagues, Levi-Setti was active in exploring subatomic particles called strange quarks before pioneering new techniques in taking scientific images that revealed details about everything from superconductors to bones and kidneys. A world-renowned expert and collector of trilobites, tiny ancient marine creatures which he called the "butterflies of the sea." Levi-Setti discovered thousands of the fossils on expeditions from Newfoundland to the Czech Republic. "It is time travel, and, at the same time, an addictive treasure hunt," Levi-Setti wrote in Trilobites, his seminal 1975 work on the subject. A Holocaust survivor who fought for the Italian resistance at the age of 16, Levi-Setti was recruited to University by Nobel laureate Enrico Fermi, who fled Italy before World War II to help lead the first nuclear reaction at University Chicago. Levi-Setti was on the University Chicago faculty for six decades and directed the institute for experimental physics that bears Fermi's name. He was born Riccardo Levi on July 11, 1927 in Milan to Paolo and Gilda Levi, a decorated lieutenant colonel in the Italian army of World War I and a Venetian aristocrat. When Italy fell to the Nazis in 1943 and the SS took over the family apartment in Milan, his parents were both hidden by family friend Elisa Setti. Riccardo was secreted into the mountains, where he hid in barns or caves to avoid the Gestapo but often slipped away to search for fossils. These years in hiding informed the rest of his life, his family said. After the war, he and his brother Franco legally added the name Setti to theirs, in honor of all Mrs. Setti had done to save their parents. Over the course of his career at the University of Chicago, Levi-Setti worked in multiple areas of physics. Early in his career he discovered several subatomic particles, including the first hyperons and heavy mesons. He launched several balloon missions to study cosmic rays, tiny energetic particles from space that rain down on the Earth. The data helped direct particle research in the 1970s, as physicists strove to understand the nature of matter in the universe. Levi-Setti also served as director of the Enrico Fermi Institute from 1992 to 2000. 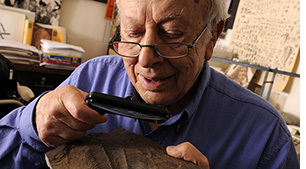 Shortly after joining UChicago as a research associate in 1956, while on a dig west of the city, Levi-Setti saw his first trilobite-extinct sea creatures which lived across the Earth more than 500 million years ago. They would go on to become a passion. Over the rest of his life he would travel around the world to dig, discovering two new species-one in Canada and one in Morocco-and publishing Trilobites and the illustrated The Trilobite Book (2014), both with the University of Chicago Press. He had an eye for patterns; upon observing the compound lenses of trilobite eyes, he became convinced he'd seen the pattern before. Rifling through papers, he found the source: it was strikingly similar to radiation detectors made to be the mathematically most efficient design to collect light. It turned out that they are similar, too, to lenses designed in the 17th century by Rene Descartes. Many of his vast collection of trilobites has already been donated to the Field Museum of Natural History in Chicago; the Manuels River Hibernia Interpretation Center in Newfoundland, Canada, where he found many specimens; and an upcoming permanent exhibit at the American Museum of Natural History in New York. His name also lives on in science: A new centipede discovered in downstate Coal City, Illinois, is now named Levisettius Campilonectus. His name is also on an exhibit at Manuels River in Newfoundland, where he successfully appealed to the Canadian government to preserve the rich fossil deposits and protect the land. And finally, in 2000, an asteroid orbiting between Jupiter and Mars was discovered, and in 2016 was given the name 45700 Levi-Setti. He was a fellow of the American Physical Society and awarded a Guggenheim Fellowship, the Leonardo da Vinci Award for Outstanding Achievement in Science, the Charles E. Sternberg Medal of the Association of Applied Paleontological Sciences, and the Commendatore dell'Ordine al Merito-one of the highest awards of merit given by the Italian Republic. In addition to his three books on trilobites, he also published two physics textbooks, Elementary Particles, which was used around the world, and Strongly Interacting Particles.